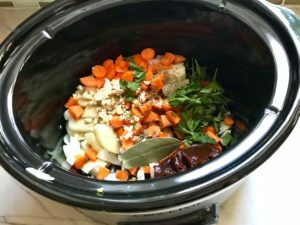 Easy Slow Cooker Short Ribs – Back again! 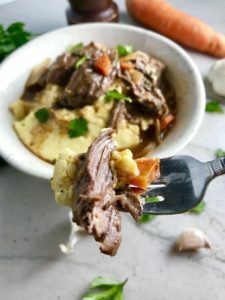 I first posted this Easy Slow Cooker Short Ribs recipe in 2017 before Christmas and it immediately became my most pinned and clicked recipe! So, I am bringing it back for Spring, Summer, and Fall! Having friends over for dinner? Looking for an easy Holiday meal? These Easy Slow Cooker Short Ribs are the perfect main dish because they are so impressive! They are decadent and taste like you slaved away in the kitchen for your guests. 🙂 The flavors from the onion, carrots, demi-glace, thyme, and garlic all seep into the meat, which is fall-apart tender and absolutely delicious. These ridiculously simple Easy Slow Cooker Short Ribs are braised in the slow cooker rather than the oven. Which means…you are FREE!!! You can work, go to yoga, play with the kids, or run other errands. You no longer have to stay in the house watching the oven for 4 hours. If you don’t have a Slow Cooker, click here to see the Crock-Pot that I have and love! 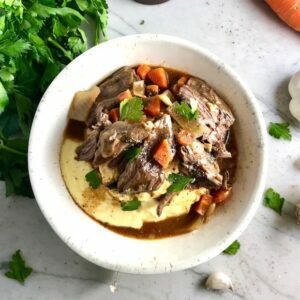 Favorite Braised Short Ribs Made Easier! One of the most popular items when I was catering was my Carrie’s Catering Braised Short Ribs. I would make them for weddings, private dinner parties, and on request, I would make them for friends and family. I would braise them in the oven, cooking for about 4 hours on high heat. 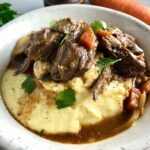 But, this recipe is easier because the short ribs go in the slow cooker, you just set and forget! You can then head out for the day, coming home to that amazing smell and warm fall-apart meat just waiting to be eaten. My original recipe also called for red wine. This version was adapted based on my children’s preferences. Both with and without wine are delicious and the recipe notes how to make both versions. In the oven, I like to get the short ribs on the bone so all of the flavor from the bones oozes out into the braising liquid and flavors the meat. However, in the slow cooker, the bones take up a lot of space, so I opt for the boneless short ribs to maximize the meat I can fit. You still get plenty amazing flavor! 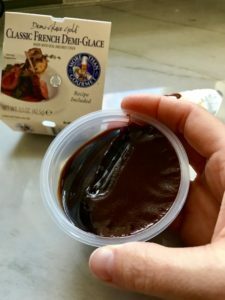 Let’s start with my secret ingredient…Demi-Glace. What is this fancy ingredient? Well, very simply it’s a broth base. But it’s not just any broth base. It’s a condensed broth made from simmering bones and flavors for days. This process extracts the gelatin from the bones, concentrates the flavors and thickens the sauce. When added to this short ribs recipe, it set it apart from all others and will take your dish from good to unbelievable! Into the slow cooker, you add the diced carrots, celery, and onion. Then add the garlic, vinegar (or wine), tomato paste, fresh parsley, bay leaf, thyme, Worcestershire sauce, salt, pepper, and Demi-Glace. Next, coat the meat in flour and sear in a pan on all sides. Add 1 cup of beef broth to the pan to get all meat bits up from the bottom of the pan, then add the meat and broth to the slow cooker. Add the rest of the broth and other ingredients, cover, set to 8 hours and that’s it! Set & Forget! 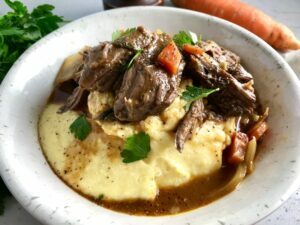 I love to serve these Easy Slow Cooker Short Ribs with Creamy Parmesan Polenta, so check out that recipe by clicking here. When the short ribs come out of the slow cooker, they will have become fork tender so that the meat easily pulls apart and then melts in your mouth. The sauce is hearty from the carrots and onions but thin so that you can (and you should!) soak it up with the polenta or a nice crusty bread. Make sure to make plenty as everyone will definitely want seconds. TIP: Make more than you need and use the extra for a round 2 recipe: Short Ribs Sandwich with Chipotle Mayo. Easy Short Ribs are the perfect main dish for entertaining because they are oh-so decadent and taste like you slaved away in the kitchen for your guests. The flavors from the onion, carrots, demi-glace, thyme, and garlic all seep into the meat, which is fall-apart tender and absolutely delicious. Dice the Carrots and Onion. Mince the garlic. Chop the parsley. Place all in the slow cooker - but save some of the parsley for garnish. Cut the short ribs into 2" pieces. In a bowl or baggie, mix the flour with a pinch of salt and pepper. Coat the outside of the short rib pieces on all sides. Shake off excess and add to a preheated pan with 1 tbls Extra Virgin Olive Oil. Sear on all sides. Add the rest of the ingredients to the slow cooker: remaining broth, tomato paste, demi-glace, red wine vinegar(eliminate if using red wine), Worcestershire Sauce, thyme, bay leaf, pinch of salt and pepper. Stir to combine ingredients, then turn slow cooker on for 8 hours. At 8 hours, test for seasoning and add salt and pepper as needed. Test the meat to ensure that it is tender and easily pulls apart with a fork. Serve over mashed potatoes, polenta, rice, or noodles. My original recipe called for red wine, but this version was adapted based on my children’s preferences. Both with and without wine are delicious. For the wine version, you would replace 1 cup of the broth and the vinegar with 2 cups of Red Wine.